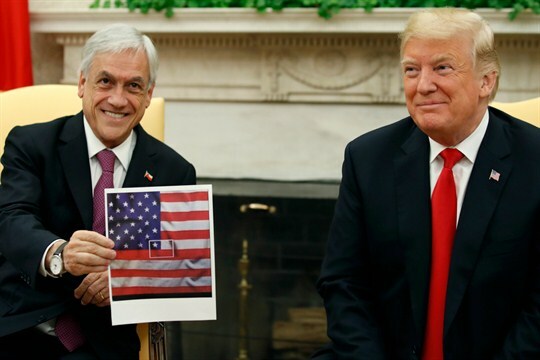 President Donald Trump, right, smiles as Chilean president Sebastian Pinera holds up a picture showing the Chilean flag at the center of the U.S. flag, in the Oval Office of the White House, in Washington, Sept. 28, 2018 (AP photo by Alex Brandon). Last week, Chile’s president, Sebastian Pinera, was at the White House for a meeting with President Donald Trump. During a photo-op in the oval office, Pinera held up a printout of the American flag. Outlining one white star and a pair of red and white stripes, he had managed to draw a smaller, Chilean flag inside of it.